In this comb, however, the ship should be upside down, because its story is a documentary about battle, despair, the loss of self, and defeat. Blood makes the bottom geometric pattern red. The story told is about the Inupiaq, one of the cultures of the Alaskan Bering Sea. They used to write in two-dimensional pictographs and petroglyphs. Their written language had vertical sections, with a set of two horizontal lines in composite perspectives — the bottom, right-side up, and the top, upside down. 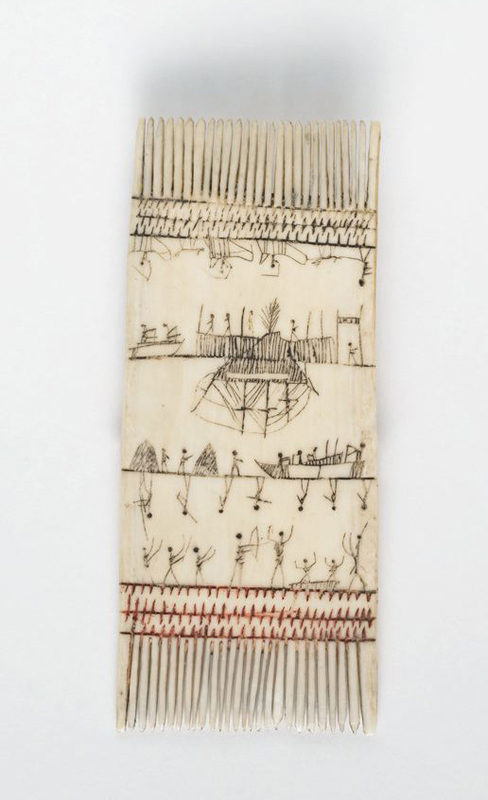 Picture 1: From the Inupiaq People of Alaska: Comb with painted scenes, 1850–1890, Walrus Tusk And Pigment. H: 4 7/8 in. W: 2 in. Picture 2: Artifacts, one of which is an amulet showng a man ice fishing. You can see the fish underwater. It is drawn in tradtional Inupiaq graphic language. Picture 3: An umiak, made in 1920, which was shown at the Portland Museum of Art. Picture 4: New England Whale Ship, about 1850. This model shows the typical outfit and gear for a deepwater whaling ship of the mid-1800s, when the industry was at its peak. Tara, fertility goddess of Gran Canaria was discovered in a cave in Telde on the Eastern coast of the island. 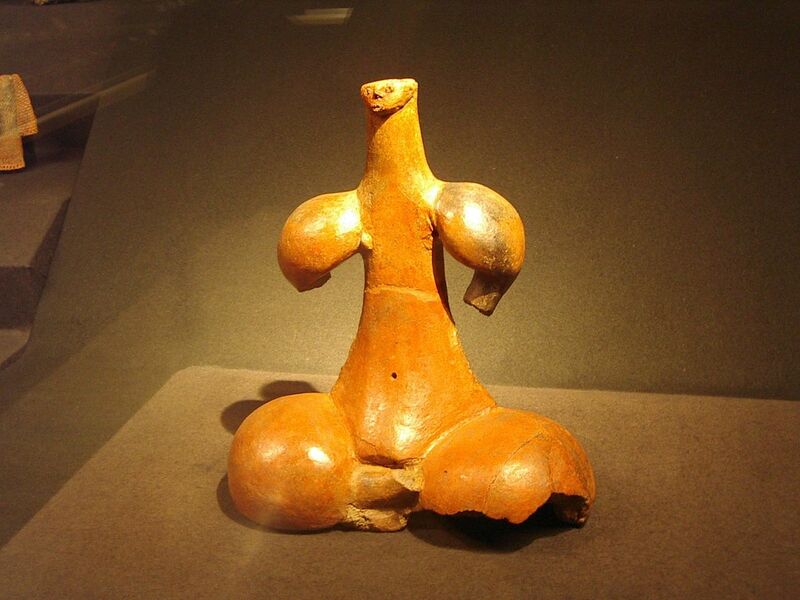 The terracotta clay statue is 27 cm tall and is a representation of a woman sitting in a cross legged position. The idol has been carefully burnished and has remains of paint on the surface. The form has similarities to early fertility goddess representations from other cultures in its triangular form. The face of the goddess is created by way of small careful incisions, and she also bears the broad hips often understood to represent fertility. Tara was left in the cave by the Guanche people, who were the indigeonous inhabitants of the Canary Islands. The town of Telde was one of the two main Guanche settlements on the Island which was then called Tamaran. The Guanche people were closely related to the Amazigh people of the North African mainland. Stones with writing closely related to to early Libyan Tifanagh writing exist in the Canary Islands, and the genetics of the people correspond to those of North Africa too. Other indicators of a connection are a matriarchal society and fertility goddess worship. It is believed that the earliest Guanche people arrived on the islands before 1000BC. The Castilian Conquest of the Canary Islands In 1402 led to the absorption of Guanche peoples into the arriving Spanish population via marriage. Guanche garments were made from goat skin and woven plant fibres worn along with necklaces of wood, bone, shell and beads of baked earth. Baked clay seals called Pintaderas with patterned designs which were used for body painting have been discovered. The Guanche people lived in caves, and also used caves as places of worship and for resting places for their deceased. Mummification was prevalent. In the North of Gran Canaria at Galdar, a sacred Guanche site, discovered in 1862, has painted decoration to the walls of a cave. Pottery, tools, bodies of the deceased and furnishings which were hewn from the volcanic rock were discovered within the cave. Many of the paintings were triangular forms which are associated with female fertility. It is possible to visit the painted cave, and the Tara idol is displayed in the Canadian Museum in Las Palmas. Jean Felix Batterposses was an entrepeueur, an inventor, a landowner a patriach and a businessman. His impact on the development of the French town of Briare was huge. 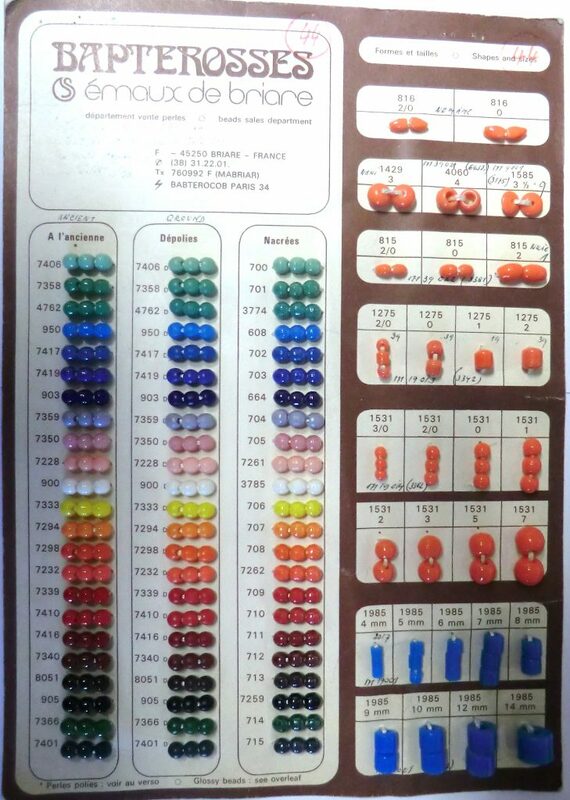 His factory produced beads and buttons in Briare from 1851 he had factories in other locations previously where he manufactured these wares. The Beads which were made in the factory in Briare, and later in the Czech Republic and Germany are nowadays mostly referred to as ‘Prosser beads’, after the inventors of the pressing technique used for the beads, British brothers Richard and Thomas Prosser. Jean Felix Baterposses himself would not use the name of other men to describe the beadshe so proudly made. At the time of production, the term that was mostly used was ‘Oriental beads’ and this description can be found on many sample cards to describe the beads. The Czechs call the beads ‘Sinter beads’ which refers to the sintering of the ingredients. Another term often used is porcelain beads. The technique and the end result of the bead production can be seen as somewhat between glass and porcelain. Depending on the mix of ingredients and the use of feldspar as the main ingredient the product is either closer to glass or to porcelain. When looking at the majority of beads from the Batterposses factory the beads have a very ‘glassy’ feel and look. The Prosser method was invented by those seeking a method for making porcelain buttons, and the first buttons were pottery. However after the beads started being made ion Briare, glassmakers from Germany and Bohemia would continue making the beads. The beads came from a history of porcelain, but were eventually sold alongside glass beads. The beads made at the Batterposses factory were mostly intended for international trade. 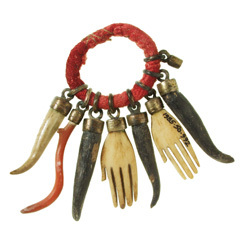 Examples of the Prosser beads can be found in Ethnic jewellery around the world. 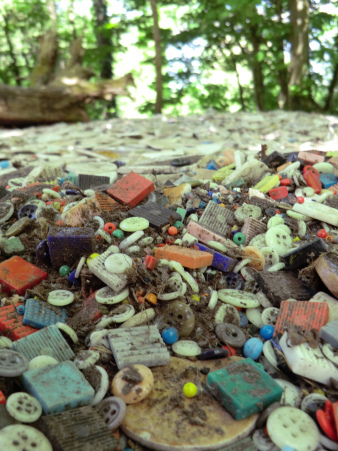 The Rubbish tips around the factory make great hunting grounds for beads. Online communities develop eccentricities, fixations on exactitude, passions to find the truth about an object, about each other, about power. 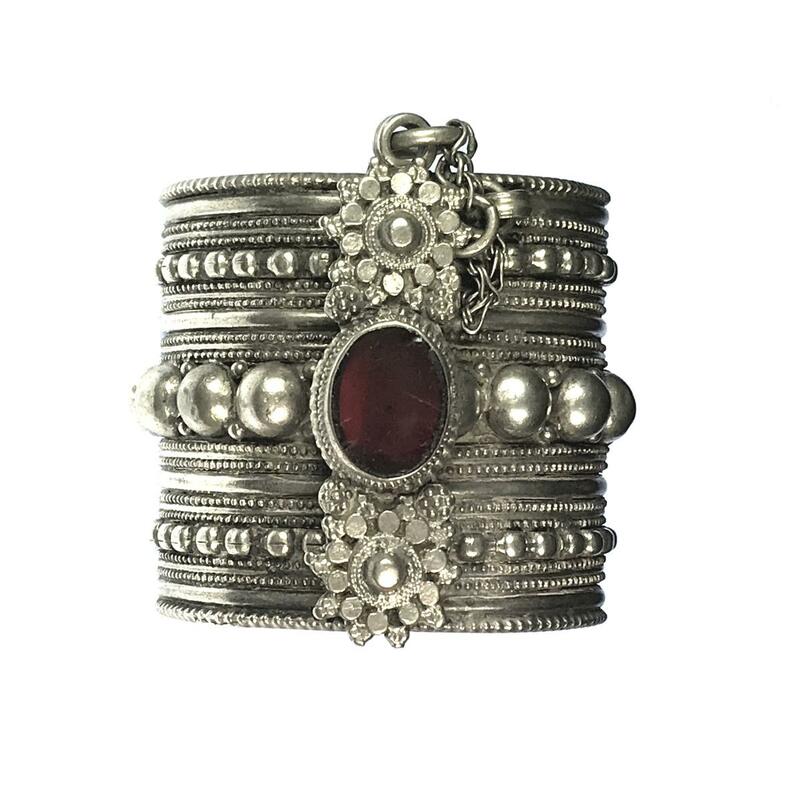 In the Ethnic Jewels Community, founded by Sarah Corbett, people pride themselves on being able to analyze every detail of a piece of jewelry, and from those observations, read it. The object is telling you where it came from, who made it, and why, but you have to translate its woven or soldered history into English. And you have to be right. There are many dealers and major collectors who request and spend sizable amounts of money on unique masterpieces and best-of-breeds in a particular genre. Consequences abound if one is wrong, and there are always people lurking, ready to pounce on a mistake. This is a universal trait, which goes far beyond one online community. 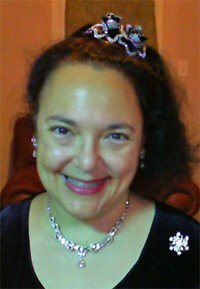 Prissy pin-prickers stalk jewelry-buying tours and auctions to deflate reputations, so they will have a reason to live. But amidst all the drama, we in Sarah’s community have developed a quirk. We have all become obsessed with identifying birds in ancient art. “What’s the bird?” is our game. People will go to stupefying lengths, ruining their eyes after gluing them to computer screens to search the most obscure documents, so they could present new scholarship with nonchalant expertise. 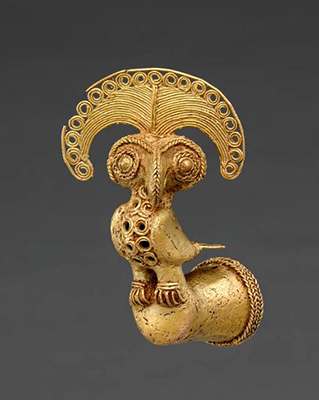 Such was the case with a gold-cast finial made by the Sinú people from the Isthmian Region of present-day Columbia. It is one of my favorite pieces in the Cleveland Museum of Art, because it shows birds’ humor, ego, and godly sense of themselves. The museum identified the bird as an owl. 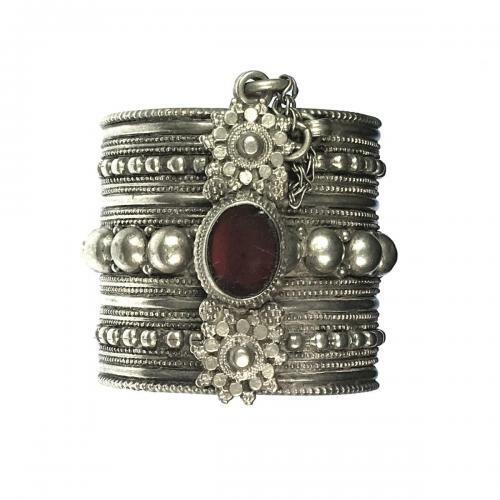 Many of the Ethnic Jewels Community members specialize in North African jewelry. 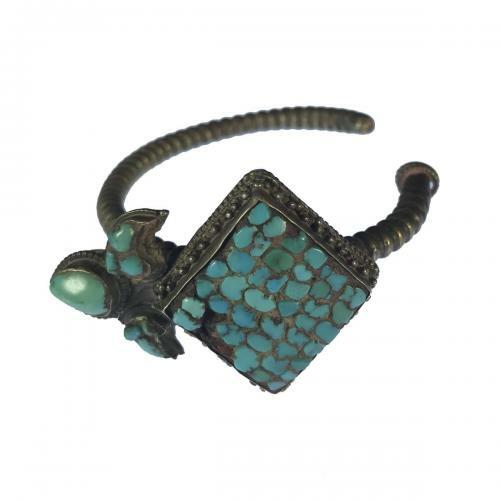 Epic battles over peacocks and eagles on Moroccan pieces have risen to legend and are now folklore. When Inder Kumar Misra saw the Cleveland Museum’s gold finial, he wrote, “I think you might find this interesting. 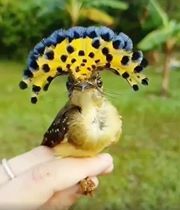 This bird resembles the one in this picture more than an owl might,” accompanied by an image of an Amazonian Royal Flycatcher. Oh my Goodness! It looked like he was right! The bird’s crest said it all. According to Wildlife World, “The Amazonian Royal Flycatcher is a passerine bird of the tyrant flycatcher family. It is found in forest and woodland throughout most of the Amazon basin in northern Bolivia, eastern Peru, eastern Ecuador, eastern Colombia, Venezuela, the Guianas, and northern and western Brazil. “I always enjoy these mysteries. “My first reaction was that this object combines the spectacular, vermilion-colored and blue-tipped crest of the Royal Flycatcher with generalized features of a hawk or eagle. The crest on your object is remarkably reminiscent of the flycatcher (which I have handled many times, and I can attest that the bird erects it widely and laterally while doing a bizarre head-rotating display). 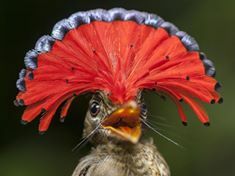 Royal Flycatcher would certainly be familiar to indigenous people of northwestern Colombia, and when held in the hand it is one of the most unusual and gripping displays of any bird I know. Here is one of many superb photos of Royal Flycatcher available on the internet. Incidentally, this display has rarely been seen outside of the context of captured individuals, but the internet does have one pretty good video of two birds displaying at one another. An eagle had to come into this story somewhere. It’s a rule. However, WHAT? Two people devoted to scholarly research in the Ethnic Jewels Community; a curator at the Cleveland Museum of Art; and an ornithologist in Ithaca, NY, had a roundtable discussion about a bird identification? The wonders of the Internet will never cease. The Cleveland Museum of Art changed the title and description. And so it was that a credible hunch from a scholar in New Delhi made it to the Cleveland Museum of Art. 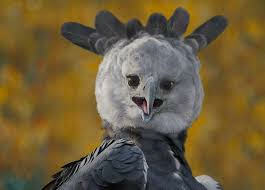 The Amazonian Royal Flycatcher and the Harpy Eagle finally earned their moment in the sun. For Inder and all our devoted members, here is the link to the revised description of the finial on the Cleveland Museum of Art’s website. As life’s rules dictate, the the exact bird identification must remain a question. A tale of sharing passions and of people power, yet also a reminder that communities should take care of everyone within them. 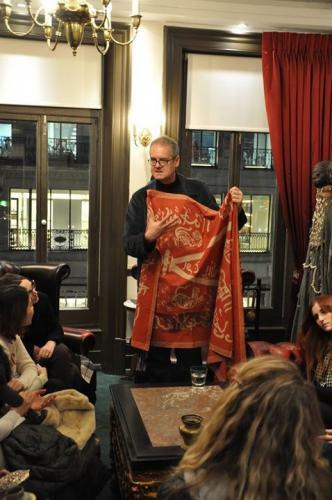 I am delighted that a conversation within the Ethnic Jewels Community led to a revision by a Museum, it is at the core of our ethos to discuss the real significance and representations of the pieces we share. Beyond this joyful news Barbara’s playful portrayal of the community made me think about how we can lift one another up by positive and insightful communications. Long may we, as group of passionate jewellery collectors, dealers and researchers remember to gently impart our understandings and kindly welcome those who join the group. 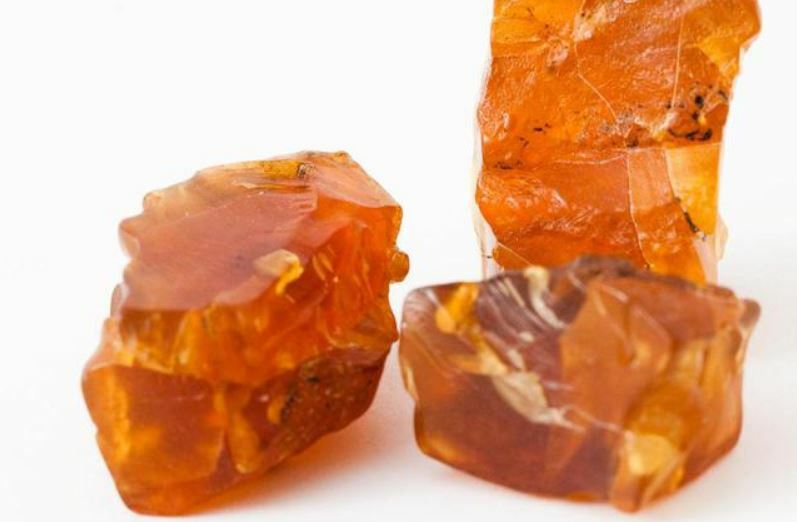 Found all over the world, Amber is a fossilised tree resin. 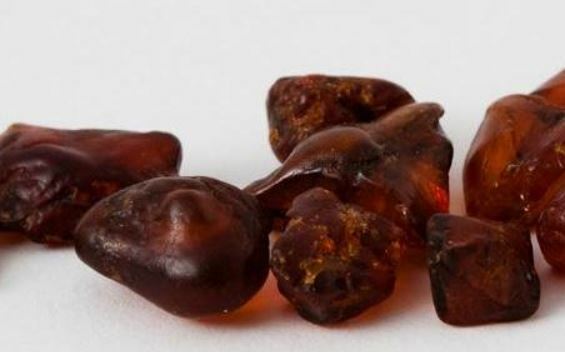 Not only prized for it’s obvious aesthetic properties, Amber has long been associated with magical power, thus becoming favoured as a medium with which to create charms and amulets to protect the wearer from ‘bad’ spirits. Resin is present in trees , and protects them as it prohibits insects from burrowing into the bark. When this protective resin is produced in large quantities it seeps out of the bark, and hardens to become copal. Those pieces of copal get buried in the soil and gradually harden over millennia to become Amber. Both Copal and Amber are light in weight, this leads to them being carried great distances often far away from their origins. So from a sap which has oozed from the bark of a prehistoric pine tree, we derive a revered substance which has an enduring appeal for use as adornment. 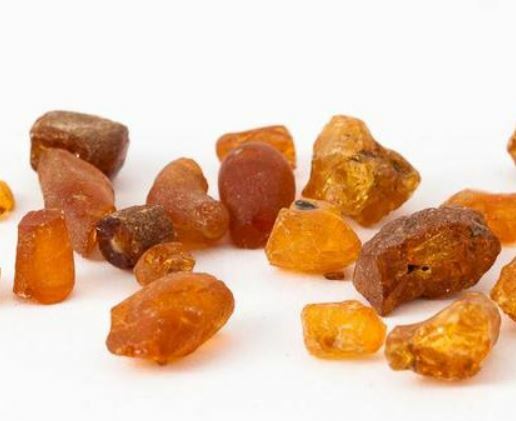 Most Amber hails from the Baltic regions of Northern Europe. 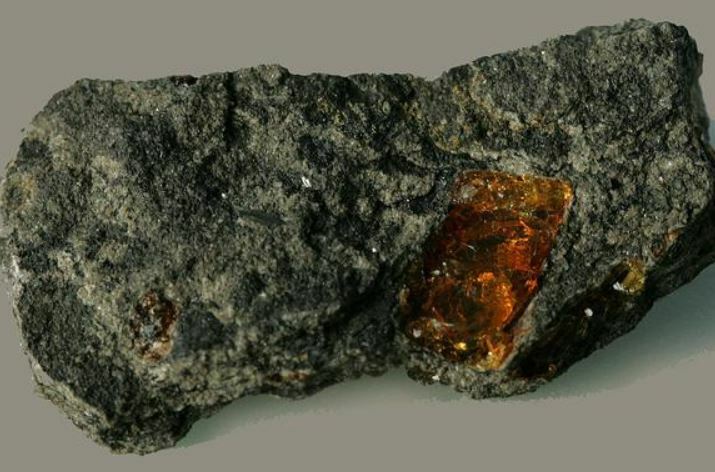 However Amber can be found all around the world. There are currently 200 amber deposits known in the world, and each year more are discovered. In places including Mexico, Ethiopia, Jordan, Austria, Russia, Ukraine, Nicaragua, Czech Republic, Australia, North America, Burma, Borneo, Romania, China, Canada, France, Japan, Spain, Dominican Republic, Italy, The Lebanon and the UK. 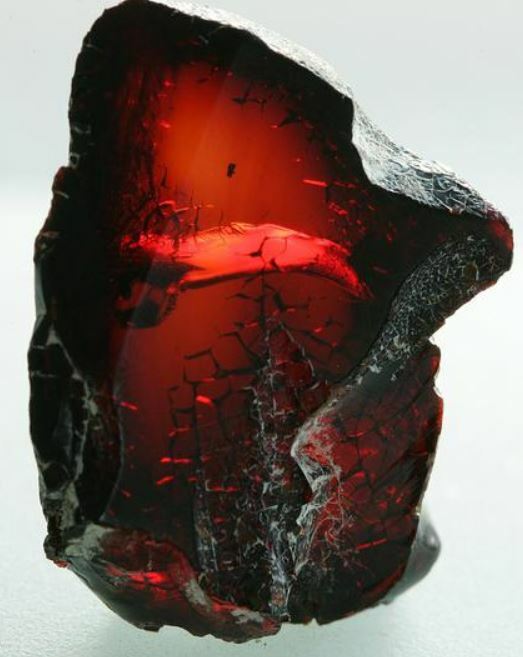 Amber often appears on the beaches of Eastern coasts of England where it has been washed ashore by the sea. The best pickings are often to be found at the high tide line after a storm. Amber has for thousands of years been popular for adornment. 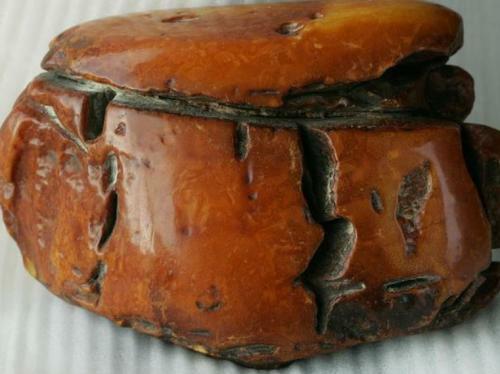 For many centuries amber was a high status material and worn by the rich and elite. Following a few decades recently where it became cheaper and more accessible it is again rising sharply in value and is keenly sought at high premiums in the current marketplace. As with any high value item fake versions of Amber abound! There are many materials used to imitate amber, here are a few tips to help you to discern one from another. 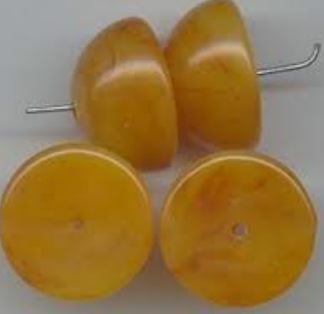 True Amber can be pressed, heat treated and dyed, so although shape and colour can be an indicator, alone they are not conclusive. does the material scratch with a pin? Add 7 heaped teaspoons of salt to 250 ml of cold water stir the solution occasionally over 30 minutes until dissolved. Does the materail float? A drip of alcohol is applied to the material. Allow the alcohol to evaporate. 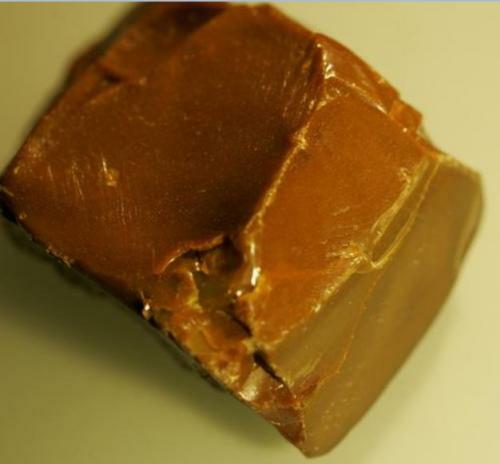 If the substance is sticky at the point of contact with the alcohol it is not Amber. An unreliable but often quoted test using polish, which lifts dye from Bakelite products, however it also lifts dyes from some other plastics and polyesther. 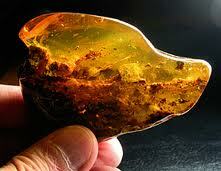 Amber Fluoresces..amber from different regions shines in it’s own particular way.. Please always be wary of plastic fumes! They can be unhealthy! So how can we observe, and methodically appraise a material to understand its origins..
Key to identifying fake amber beads. 1. Can the beads be scratched with a pin? Yes. Amber or plastic. Go to 4. No. They are also heavy and cold to the touch. Glass or semi-precious stones. Go to 2. 2. Are the beads identical in colour and shape? (They can be different sizes). 3. Are the beads striped? No. Probably chalcedony. 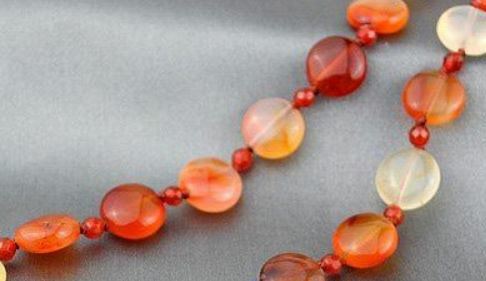 An orange/red form of chalcedony is called Carnelian. 4. 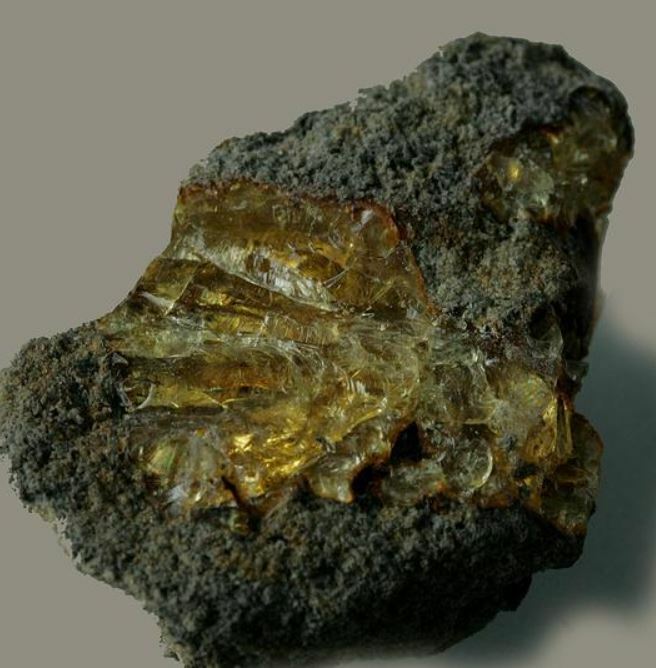 Can you see separate chips of amber within the material? Yes. Polybern – amber chips embedded in polyester resin. Usually the resin is transparent and amber-coloured, but opaque white or black resin has also been used. Where the maker has been mean with the use of amber chips, the chips are only found on one side. 5. Do the beads float in a saturated salt-water solution (see above)? Yes. Amber or polystyrene. Go to 6. No. Plastic. Go to 11. 6. Are the beads transparent/translucent or opaque? 7. Do some of the beads have bulbous centres to the string holes? 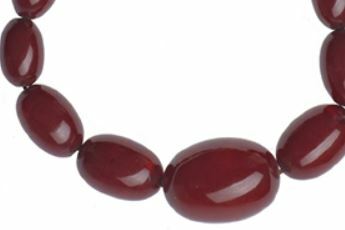 The beads may contain inclusions such as small insects ( I was recently told that an insect fallen into sticky resin would struggle a while! Be aware of this when observing the inclusion, if its too crisp and clear it may have been planted in resin), bark fragments and oak hairs (only visible with a hand lens). Oak hairs are a good indicator of Baltic amber. If the beads contain spangles (circular cracks) then they have been heat-treated. Old beads may be crazed (fine surface cracks). 8. Is every bead identical in shape? (They can be different sizes). Yes. Amber or polystyrene. Go to 9. 9. Do the beads contain dark swirls? No. Amber or polystyrene. Go to 10. 10. Are the beads different shades of colour? No. Polystyrene or amber. 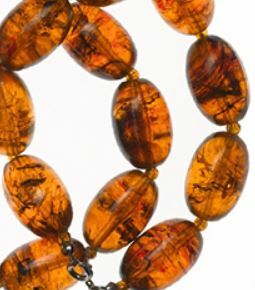 It is rare to get every bead of opaque amber the same shape and colour. Old amber can be crazed (fine surface cracks), though polystyrene can be coated with acetate which cracks and can peel off in places. 11. Are the beads transparent/translucent or opaque? 12. Do some of the beads have bulbous centres to the string holes and/or mould lines along the beads? 13. Do the beads contain spangles (circular cracks) or deep surface cracks? No. Probably Bakelite, though could be acrylic, celluloid, polyester or another plastic. 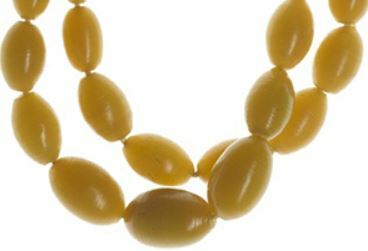 Bakelite beads, mostly made in the 1920s and 1930s can be either smooth or faceted, and are usually oval, spherical or barrel-shaped. Red is the most common and popular colour, but other colours also exist. Other similar beads of other plastics also exist. 14. With a hand lens, can you see machine lines around the beads and fine crazing? Yes. Galalith. This is a rare early plastic made from casein (milk protein) and formaldehyde. The necklaces we have seen are a dirty greenish/yellow colour. 15. Does it contain swirls? No. Probably Bakelite, or celluloid. 16. Can you see mould lines around the beads? No. Bakelite, acrylic, polyester or another plastic. 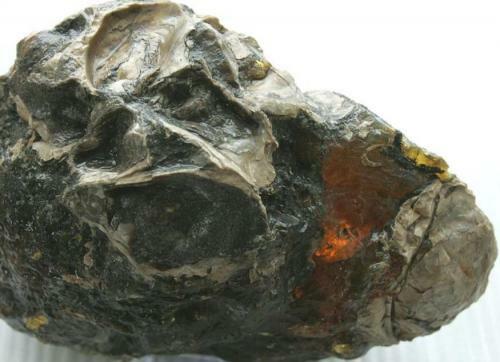 This basic step by step diagnostic will help you to begin to learn the different materials which resemble Fossil Amber. When running a high end gallery purchasing is a major part of the daily business. Michael Backman as a prominent London dealer is regularly offered large estate collections and makes many, many purchases each week. These purchases are often mixed collections of great art objects including items suited to the London gallery, among those collections are items which are less suited to the Michael Backman Gallery catalogue. 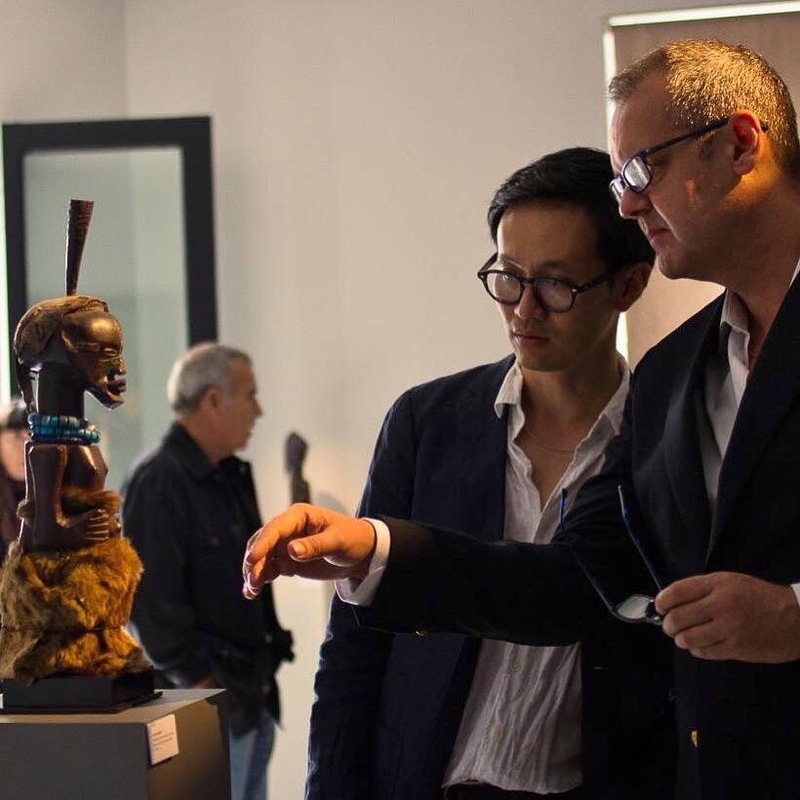 When I first joined Michael and Eddie as a consultant in the Mayfair Gallery, we discussed the objects among Michael’s collection acquisitions which were not selected to be offered for sale via the gallery. 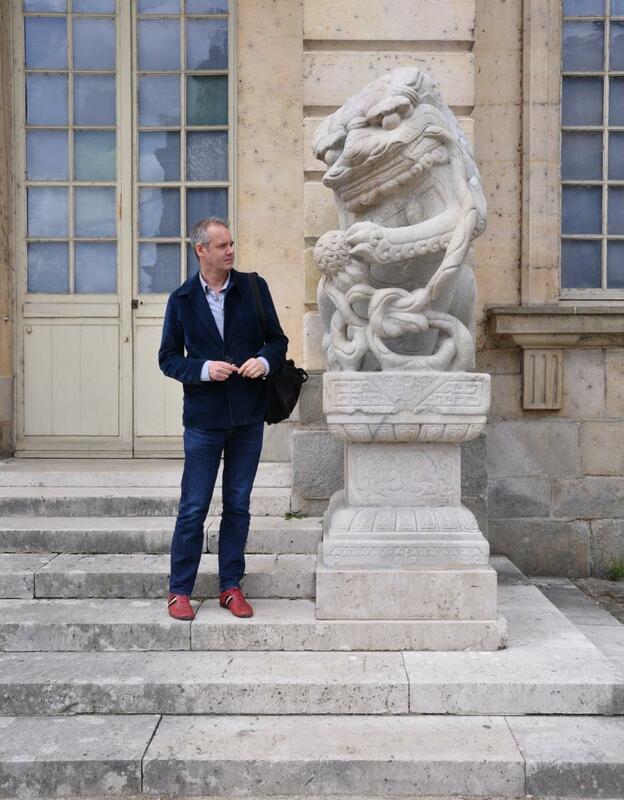 Leading to the concept of the Ethnic Antiques Website. At Ethnic Antiques you will find beautiful authentic Ethnic Antique Decorative Objects for sale from those collections. All items will be priced below £500. These beautiful pieces are perfect for emerging and established collectors,who want to be assured of good provenance and accurately described pieces to add to their collection. Each piece has been handled and appraised by Michael Backman and Sarah Corbett, we both pride ourselves on good research and integrity in the field. We also research the market place to offer sound pricing structures for all items. We want these objects to be accessible and loved, we want the field of purchasing to be transparent and dynamic. 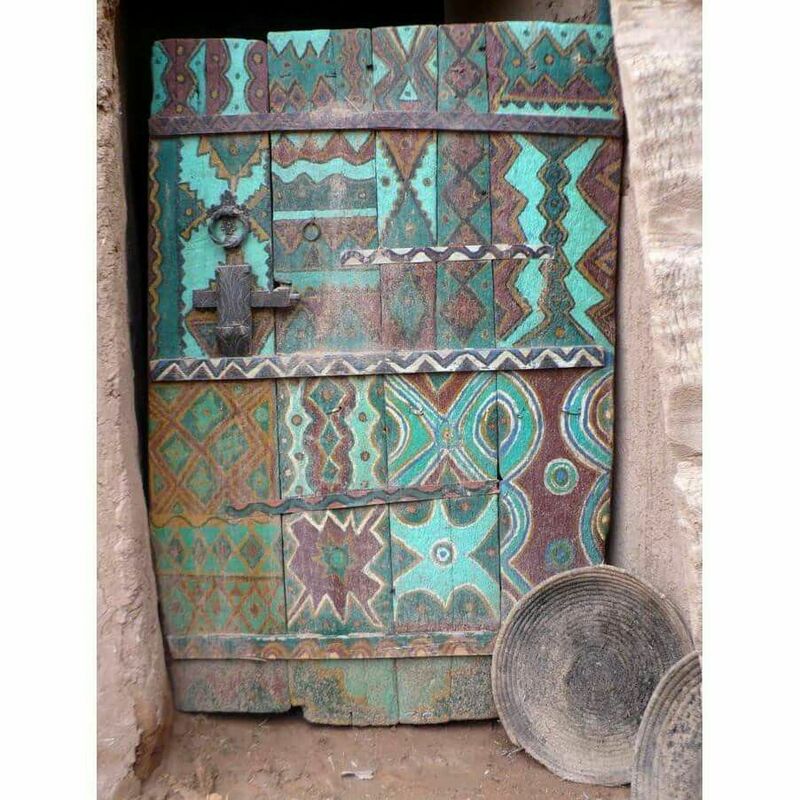 Our plan to achieve this is simple; the objects will be offered on the Ethnic Antiques website with concise but sound descriptions, images and competitive pricing. We will then hold flash sales via our facebook page on a bimonthly basis, offering substantial discounts on a selection of the pieces. To take part in these sales please ensure that you like and follow our Ethnic Antiques facebook page. To welcome you all to our new website we will be holding a fantastic Launch Promotion via facebook please visit our facebook page to take part in the launch event. Our aim is art for all! 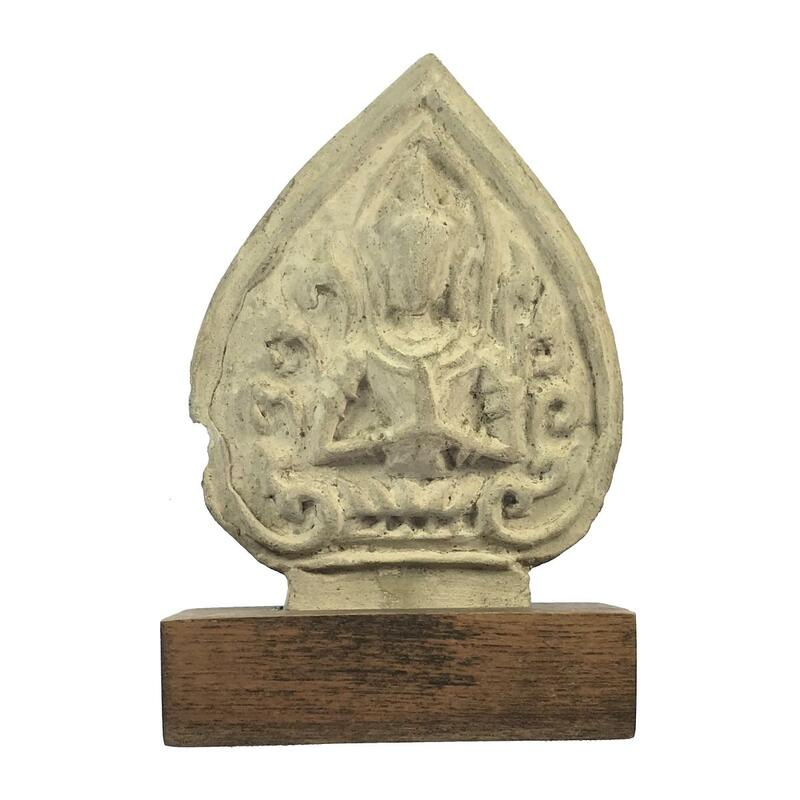 Michael Backman Ltd and Ethnic Antiques. A year of developments. 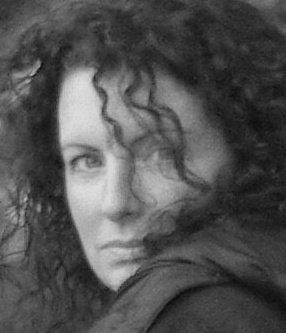 By Sarah Corbett. A meeting between those who share a deep passion for a particular topic can spark a million ideas. This was certainly the case when Michael Backman and I met a few years ago. I visited Michael’s beautiful Mayfair gallery to purchase a pair of Anklets, following a couple of hours lost in animated conversation, I realised as I left the gallery that as rare and wonderful as the Anklets were our conversations were the more precious acquisition on that day. Clearly, we both share a deep interest in beautiful decorative items from around the world, however there was also the drive to understand the history of those who created these items and the cultural significance of them. Further to this love of the items themselves, we shared a desire to offer well researched, factual information related to each piece. It quickly became clear that our skills and knowledge could be collaboratively complimentary. With the precise business skills of Eddie Chin we felt that we had the perfect team to grow these ideas and our creativity, broaden our online activities, reach more people and share more information whilst upholding the integrity and standards of the Michael Backman brand. The past six months have been spent moving all of our online activities to a new and exciting realm; Developing our social media and building two new websites which will both launch this summer. You can find out about these websites via our Instagram, Facebook, Pinterest or Twitter channels. The first of our new websites to be launched is called ethnicantiques.com offering a wide range of decorative arts from around the world all of which are in a price range up to £500. 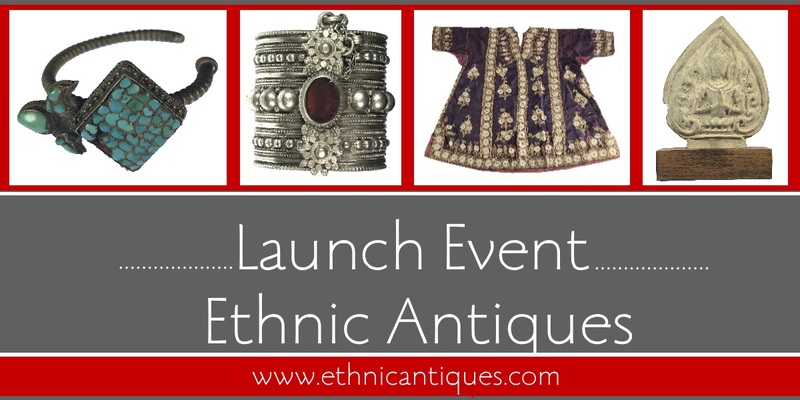 This dynamic project will offer regular Flash sales which will be announced and held on our ethnic antiques Facebook page …..please visit the page and like and follow us to ensure that you never miss a deal and can always be part of the fun. Our original gallery website michaelbackmanltd.com will be making some big changes too with a comprehensive redesign to offer a great user experience for those visiting the site. If you do not currently receive our catalogue we invite you to visit the website to request your copy via a monthly mailing list. We are looking forward to sharing, communicating and trading with our fellow enthusiasts and collectors. We are committed to helping you to build your personal collection with great pieces with sound, well researched information offered alongside professional reliable service. The Global City – A book launch at the London Gallery of Michael Backman. 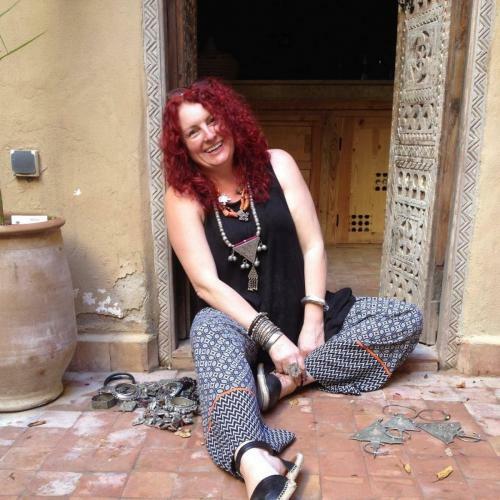 Review and comment by Sarah Corbett. A bridge between the world of the historian and the world of the collector. A concept which seems obvious, a concept which requires ‘two way traffic’. As one whose awarenesses are deeply rooted within the realm of collectors and gatherers, I frequently dip into the world of historians to find details to affirm, or otherwise concepts around objects which I either own or appraise for others. 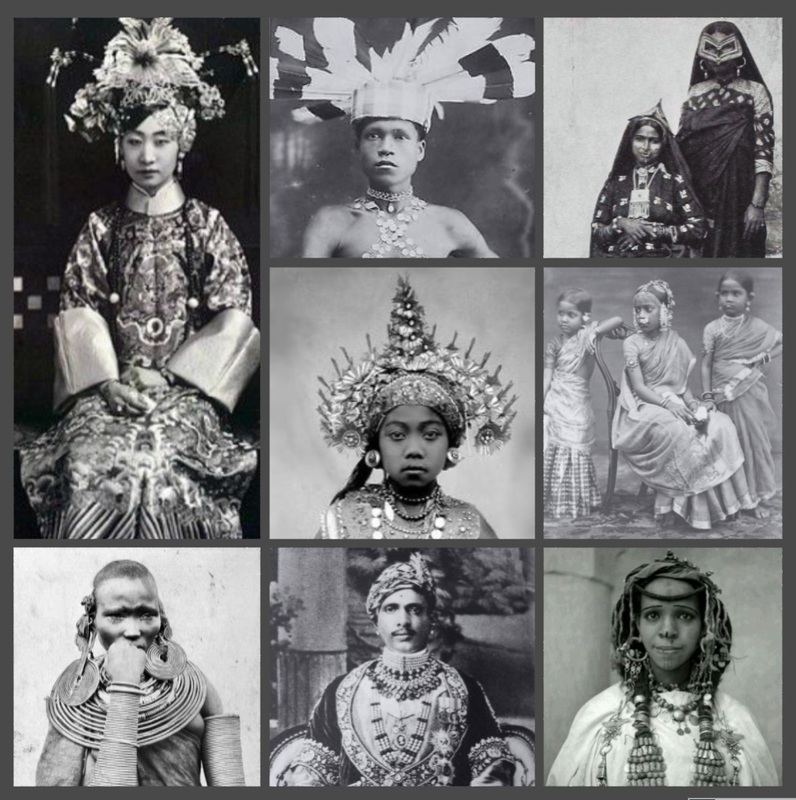 This research is satisfying and brings much to a multi layered strata of connections and understandings of adornment as a worldwide and fluid topic. Continue reading The Global City – A book launch at the London Gallery of Michael Backman. Review and comment by Sarah Corbett. Tetouan is a town in Northern Morocco with Strong Historical links to Grenada. The drive to adorn oneself is considered by some to be one of the most basic human drives, following closely the need to procreate and survive. The act of personal adornment is far from a simple exercise in beauty, and can communicate much about a person and their living environment. An exciting collaboration between Michael Backman, Sarah Corbett and Eddie Chin. 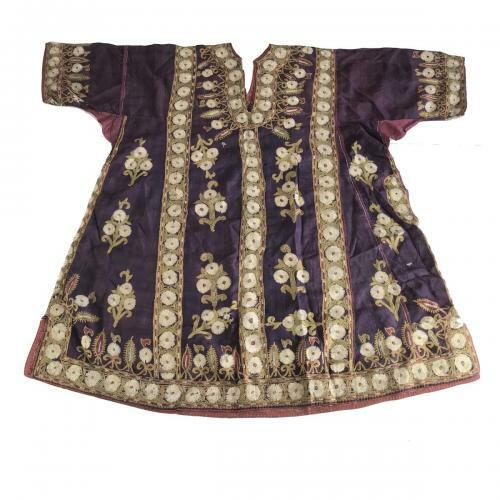 Bringing you a fine array of beautiful ethnic art and adornment.